Während die norditalienischen Städte wie Venedig und Florenz durch Komponisten wie Vivaldi und Albinoni die italienische Barockmusik schlechthin verkörpern, gilt Neapel allenfalls als Ort für Opernaufführungen. Dass Neapel im Barock ein Zentrum des virtuosen Violinspiels war, ist heute kaum noch bekannt. Als der berühmte Komponist und Violinvirtuose Arcangelo Corelli aus Rom einmal in Neapel gastierte, musste er sich beschämt geschlagen geben: Gegen die Künste der Musiker aus Neapel konnte er nicht reüssieren. Christoph Timpe hat vergessene Violinmusik aus Neapel wieder ausgegraben und mit seinem Orchester „Accademia per Musica“ mustergültig eingespielt. Die bisher einzeln veröffentlichten drei CDs sind nun in einer Box zum Sonderpreis zusammengefasst. Whilst the north Italian cities such as Venice and Florence simply embodied Baroque music per se through composers like Vivaldi and Albinoni, Naples rated at most as a place for opera presentations. That Naples was a centre of virtuoso violin playing in Baroque times is hardly known today. As the famous composer and violin virtuoso Arcangelo Corelli from Rome once gave a guest performance in Naples, he had to abashedly admit he was beaten. He could not succeed against the expertise of the musicians from Naples. 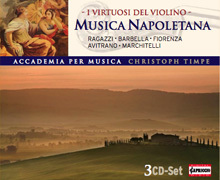 Christoph Timpe has again dug out forgotten violin music from Naples and created praiseworthy recording with his orchestra „Accademia per Musica“. The formerly individually published three CDs are now collected together in a box at a special price.